Hi all, I am writing this review on the basis of what I actually experienced so far from my Toyota Innova G 8 Seater. I purchased this car around 2 years back at price of Rs 10 lakhs and would really compliment the car maker to make this car a perfect family machine in all prospects. My Innova is powered by a 2.5 liter diesel engine inline that has got great power, acceleration and stability. While I drive it in cities the fuel efficiency it delivers is somewhere around 9 – 11 kmpl and when I am on highways it has got fuel efficiency of 12 – 13 kmpl. Like other Toyota cars, the 5 speed manual transmission of this car is also quite easy to shift gears. From the point of safety, my Innova is blessed with features Anti-theft alarm, Power door locks, Child safety locks, Central locking, Keyless entry and Traction control. Moreover, its tough body shell is another safety advantage over other MPVs available in the same range. I think that in coming Innova version features like Sun-roof/ moon-roof can also be added. Innova has got its different design and styling that is held by its sloppy front and curvy rear dynamics. Broad wheels with fascinating wheel caps and side chrome cladding make my look more alluring. The enchanting interior of Toyota Innova is totally distinct and intelligently designed. The dash and instrumental cluster have been given a unique styling while, four spoke steering wheel is quite comfortable to turn this car in a limited area. 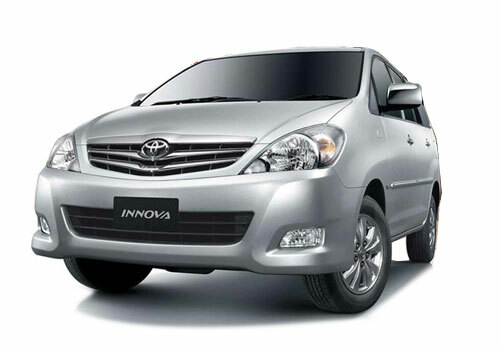 One complimentary factor of Toyota Innova is its powerful AC which chills the entire 3 cabins instantly. The comfort for the first two rows is quite satisfactory, but the third row has quite tough seats and improper seating arrangement. Toyota innova is a big name in styling and performance. This wonderful car is found all over the road. It is pride to be owner this Innova. It is very spacious inside and comfort too. Toyota Innova is such a nice family car. it perfectly suit Happy family. The 8 seaters is delivers excellent performance.